I don't know how the game works so I'm going to treat it as a Yu-Gi-Oh game or something like that. Also there's our Anna alt finally (poor girl always getting shafted). AND NY CATRIA GIMME THAT. Lucy about to drop Marthxodia on these scrubs. Ew. It's only 1 orb now so it's not too intolerable, but I hope this doesn't become a trend in the future. The last FOUR focus heroes I’ve pulled are -ATK. Four ****ing times in a row. Attack bane. Before I was annoyed that I couldn’t for the life of me actually PULL a focus unit. Must’ve wished upon a monkey’s paw or something because I don’t have that problem anymore but I still get to feel backhanded. Now that IS has doubled down on this idea of banes, it’s a bit saddening. My only hope is they introduce a way to +1 heroes without requiring a second body, but I wouldn’t bet on it. "Hey so some people are lacking incentive to play AR, maybe we should do something to make it more rewarding, like maybe quests that give more Heroic Grai-"
"Orbs. Give them a paltry amount of Orbs." "But sir, wouldn't that give people less incentive to spend mone-"
I really don't understand the decisions they've been making lately. I just wish they would add update who you can get with the grails more regularly, I haven't used any yet (habitual pack-rat) and I had decided to go all in on Smol!Azura since a +10 dancer will probably always be useful but until she drops I just keep hording them lol. I didn't even realise they haven't added Smolzura yet. That means I'm gonna have to wait even longer for New York Laegjarn than I thought. they could also make it more appealing by fixing the problems with the mode and making it actually fun to play, but that would just be crazy. The last day of the Legendary Hero banner was pretty good! I pulled another Legendary Hector, so I gave the Distant Counter to my Summer Young Tiki. The only unit I have right now that can really benefit from the skill is Helbindi, but I can wait for a bit. I also got this particular 5-star during my last rounds of summoning from the banner! Yep, Legendary Azura! Her asset is HP, while Res is her flaw. Not too shabby since she's mostly just there as the team dancer. She is now optimized as the perfect dancer for my Flier Emblem team! I particularly want to use her season in Aether Raids comes up; I've been using my Flier Emblem team as my main offensive team, and I think she'll help out her fellow fliers a lot as the fifth member. -2 Summer Tikis, both of which had +SPD with 1 having -RES and the other having -HP, so that's super nice. Merged them for the bonus HP for when the Merge update comes. -Flora, who had +RES -ATK. The game really doesn't want me to get a Fire Legendary Hero, which is the only LH Blessing I'm missing whereas I have 2 Water Heroes, 2 Wind Heroes and 1 Earth Hero. In the meantime, I've got New Years Hrid from the New Years Banner. +RES, -DEF. That's going straight to Laegjarn, lol. Glad I kept saving my Orbs after the L!Azura banner. They even had him attack a blue enemy in the demonstration when he's red, they're not trying to hide it lol. Flora with Hoarfrost Knife, Sturdy Impact and Bonfire for maximumer memes. Interesting how the beast transformations work. Will be quite tricky making them work on tactics/mixed teams. I have a very strong suspicion this skill will end up either as uninheritable or severely restricted in some way. Either way it seems like it's meant to be a counter to armors, which isn't exactly a bad thing in the current meta. So Naesala is our GHB coming out. Laguz royals were busted in Tellius so them having uber powercreep PRF abilities makes perfect sense in a way. Unpopular opinion - I want Steady Impact to be inheritable. Look, I know it's busted. But most of the busted skills are either reserved for armours, or a Prf. IMO what makes this game fun and what gives me incentive to pull (aside from merges on 5-Star exclusives which happens rarely) is fun new skills worth pulling for and putting on my favourite units. One of the reasons I was getting bored of the game was because of the exclusivity of all of the powercreep. It's boring when all of these awesome skills are exclusive to specific units. Some are OK but for the second half of 2018, most of the new skills worth going for were exclusive to specific unit types or specific units and that made the game get stale for me, especially as a Flier main. I'd rather see Reinhardt, Brave Veronica, and Odin running around with Steady Impact than just Tibarn. At least I'd get a variety in opponents rather than having to play around a specific unit and their OP exclusive skill (see: Surtr). Also Steady Impact could be great for PvE stuff too which I honestly care about more. Anyway, if they aren't planning on a Skill Refinery, at the very least, give us demotes and some good ones too. Its weird hearing Leanne speak english, though it makes sense 'cause you can't really make her native language audible and possible to understand, as it is fictional. I've done a lot of abyssal maps lately and I feel like IS actually doesn't go too crazy with the types of skills they give units. Most of the difficulty comes from the stat inflation. A bigger concern with these kinds of skills for me is that IS will use them as an excuse to go even crazier with the stat inflation on PvE content. She did eventually learn to speak a little of the Beorc tongue in RD, which fits with what seems to be her level of speech here. I'd still say it would be easily counterable though if you already have mega tanky units or can build them, especially those who also have it. Just an example and of course you could do variations on this to cover different things. Iote's Shield S-Slot if there's archers, Darting Stance 3 S-Slot if there are speedy enemies and you want to prevent getting doubled on Enemy Phase, etc. I realise this isn't a conventional unit build especially with the merges but you can achieve similar results with F2P/4-Star units. NY!Laegjarn actually has an extremely similar statline to regular Laegjarn, for example, though misses out on the fact there is no lance equivalent to Safeguard though we may get it yet, but otherwise you could do something like this with her and you can do it without spending Orbs on merges. Finn is also similar to her. I also concur with Robert of Normandy , I've also cleared a few Abyssal maps now and stat inflation is the real issue. Rarely do they actually put the new OP skills on the Abyssal enemies, most of the time it's the simple stuff like Wary Fighter on armours I have to play around, or a pesky Brave Bow archer in the case of my Fliers. Kinda feel like Sturdy Impact is overhyped. It's a player-phase skill designed to ensure you survive an attack you initiated. It's nice for not getting killed, so it gives you more leeway to attack things without discretion, but it doesn't actually make a difference compared to Death Blow if your unit was already going to safely kill the enemy. It's definitely a great skill, but it basically just makes your unit into the ultimate battering ram, something you can safely slam into opponents to soften them up. That's more of a neat trick than the type of "oh my god this is so broken enemy phase is dead" panic I've been seeing elsewhere. Can't comment much on that new Fire Emblem Heroes trailer, but man, Tibarn and Nailah look busted! I might pull for those two, but I don't know if they're both characters I really need to pull for right now. DD6 + Null C - Disrupt 3 + Atk Ploy 3 on Micaiah would be the ultimate crusher of cavalier teams on AR. Finally can share my thoughts about the new banner. I'm extremely happy with it, Radiant Dawn is one of my favourite FE games so seeing new representation is really appreciated. I did vote for Tibarn in CYL2, so yeah, really excited to try and pull him if the gods of gacha are merciful. Tibarn comes with lots of powercreep, but honestly, he's the hawk king and if he wasn't one of the most busted units in the game he wouldn't be true to his RD incarnation. Seriously, he's one of the best units in the whole series, absolutely insane. On the same vein, Nailah looks so damn good too (and she looks pretty nice too), being a queen laguz well it was to be expected, happy for the dazzling staff nerf, it would make AE much more easier if I got her. Will probably try pull both of them, I have 900 orbs at the moment and using the summoning tickets hopefully I can get them both without spending too much (I still haven't gotten a single 5 star in the banners with summoning tickets so hoping this is the one). Then there's Reyson and Leanne, one probably getting demoted (Which is fantastic) and the other somehow speaking in English (not complaining, not going to have her saying nonsense lol). And Reyson being green he has triangle advantage against Oliver, which is hilarious. So yeah, 10/10, gimme them now pls, hoping for a good number of tickets on the forging bonds event, which by the way, is going to give heroic grails now. This is good for people who are trying to +10 a TT/GHB unit, but for me right now I'm still hoarding them, don't know if they'll introduce a unit there that I want to +10. Also happy for Naesala, everyone gets a free laguz, let's see what he has in store. Heroic Grails are being added to Forging Bonds. Good, because more Heroic Grails. Bad, because I actually have to slog through Forging Bonds now. Praise be. Now I have even less reason to bother with AR. now replace the reward on the second RD map with Grails too, please. Been thinking about this banner and honestly I might agree with Sturdy Impact being overhyped. Not in the sense that isn't a fantastic skill (because it definitely is, and I'm still pulling for it), but people are ignoring just the concept of beast units in general. They're 3 Mov units that get like three built-in weapon effects with no obvious drawbacks. Reverting to human form just means they function like a still really good Gen 2 Infantry/Flier. Like, Nailah's weapon is still Owl Tome X Slaying weapon without the transformation. The transformation just gives her Wo Dao and Atk +2 which is just gravy at that point. And it's not like it's hard to stay transformed, especially on an all-beast team. It seems like they're forgoing a general stat-hike for Gen 3 in favour of beast units with their 3 Mov and silly Prf weapons. Obviously they will probably add stuff like Beast Killer weapons and a skill or Sacred Seal that nullifies transformation effects to even things out, but beast units are looking like a real case of "you need to play around them" which could get annoying in Arena because if you build a team to take them on, they could get screwed by a non-beast team next match. Can they even attack without transforming though? I thought they couldn't in Tellius games. Seems they can in this game, otherwise there would be no point in giving them stuff like "Grants Atk+3. If foe is at 100% HP, unit makes guaranteed follow-up attack" as non-transformation weapon skills. Not like it makes much difference even if they can't, transformation is easy. -Beasts basically function like Dragons in that 'Beast' is essentially another class on top of their standard movement type. That means they get access to their own unique buffs like Hone Beasts so they can synergize with themselves, but it also means stacking weaknesses with their movement type. We will get beast-slaying weapons in the future, and once that happens, units like Tibarn will have to contend with both beast killers and archers (and Merric, I guess). Having exploitable weaknesses does help keep them in check. -Transformation is easy, but it's not effortless. Players need to make sure that their beast unit isn't touching any non-beast/dragon units at the start of a turn. Depending on the map and your team comp, it might not be possible for them to transform right away. If you do stack your team with beasts/dragons, then you have a fairly predictable composition that people can prepare for. That's especially true for AR, where you can just have a reserve team just for taking on specific team comps. -Looking at Tibarn's stats, he's gonna be super easy to snipe. His attack is phenomenal, so with his followup ability and 3 movement, he'll tear up units in range. But his speed is middling and his resistance is poor. Any magical unit can delete him without too much trouble, and bulky blue units can likely still wall him (Adrift Corrin can even hilariously shutdown all his abilities with null-followup). I bring this up because it's easy to look at that three movement and all those extra effects and think these guys are going to be nightmares, but I think we'll be alright. Tibarn is just a strong physical player phase unit. Your approach to dealing with him likely won't be substantially different from how you'd deal with similar units. Overall, I think Beast units are going to be really strong, but I think they'll mostly be just powerful additions to the meta rather than something that completely changes how you approach matchups. Just my first impressions, anyway. EDIT: Oh, minor point, but worth noting that it seems Beast weapons cap out at 14 mt like ranged weapons rather than the standard 16 for melee weapons. That's why they get +2 atk when transformed; they're (on paper) statistically weaker than normal melee units when not transformed, so transforming brings them up to the standard for their own weapon type. Yeah they totally can attack without transforming, in the trailer you can see Nailah getting attacked I'm her normal form and she just transforms in-battle like the dragons. And smart nitpick, in Tellius games laguz could not attack if they weren't transformed, but they could actually counter attack. They would just punch the hell out of people, but with the garbage stats they have unstransformed don't expect them to do anything fancy, just pray they actually survive lol. FE10 in particular gave lots of classes that are usually defenceless counterattack options. Still disappointed Oliver didn't get to smack people with the Matrona staff and its 100% crit rate. I might need to actually get three Tibarns for fodder because the more I think about Clair having Sturdy Impact, the more I think it could be one of her best A-Slots, at least as far as my +10 Summoner Support Clair is concerned. >My Clair is -Def but after the merge update, that will go away so she will have 30 Def at base. Sturdy Impact brings her to 40 Def on Player Phase, and gives her some extra Atk which is also one of her weaker stats. 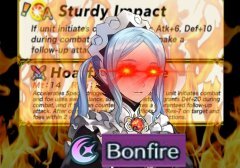 >Her Spd and Res are already so high that she doesn't really need to buff them for most situations, ally buffs will give her what she needs there. >Her Prf wants her to focus on taking on Armours and Cavalry, the former of which usually have high Atk and Def, so Sturdy Impact helps her counter those even harder. The disabling follow-ups part of the skill will also allow her to not worry about Quick Riposte. >Not to mention how she can normally run Def Ploy and Brazen Atk/Res to make her even stronger. It's like, her Player Phase will become good enough against physical units that she's basically a Mixed Phase unit due to having so much damage mitigated on Player Phase while also dealing more damage. Deidre negates adaptive damage and gets a boost if her Res is higher. -Julia and Deirdre got some much needed refines against dragons, especially the Nullifying Adaptive damage bit against Dragon's "Attack the lower of DEF or RES". -Tailtiu having Wrath is a reference to the fact that she was the first user of Wrath in the series, much like how Ayra was the first user of Astra. Since Mages can't use Wrath, it gives Tailtiu an effect to consider using her over other Mages. -Seliph's is interesting, although I think it would've been better had it have a bit wider HP Restriction. Sure, the intention is to prevent him from being one-hit KO'd by Mages. And taking the HP restriction off would potentially set up for some insane Noontime/Sol Survival shenanigans. But I doubt above 50% will keep him from surviving decently from doubles, unless this somehow includes Brave effects like Reinhardt and Desperation. As for the Refine, Seliph should've gotten a Brazen refine rather than another Bond refine. Edit: Hel's weapon has a Miracle effect like Seliph, except without the above 50% HP requirement....yeah that's fair. Come on.....the Merge Changes aren't part of the update? Why? Edit: That said, would you believe I got pitybroken by regular Hector? +HP, -RES. Not optimal, but at least his ATK and DEF weren't hampered.